Just in time for Black History Month, "Hairlooms" asks: Why is it so difficult for Black women to embrace their hair? And, how can Black women overcome the multi-layered challenge of embracing their natural hair and beauty? Author Michele Tapp Roseman helps readers answer these questions for themselves, to write a new story that they can pass along. 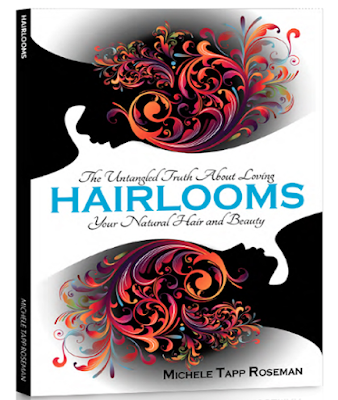 Michele Tapp Roseman wrote "Hairlooms: The Untangled Truth About Loving Your Natural Hair and Beauty" (HCI Books – ISBN: 9780757319679 -- $14.94 – February 2017) after years of trying to figure out how to love her natural hair. When she finally learned how to transition to natural hair, she still had to battle her emotions. Learning how to reduce natural hair breakage and high hair shrinkage did nothing for her feelings. She couldn't really explain why she hated her natural hair. Talks with other Black women who wore natural hair let Roseman know many felt the same. Hairlooms is the story of Michele Tapp Roseman's emotional hair transition plus hair stories from 32 amazing women and men she interviewed over the course of 6 years. Major General Marcia Anderson—Senior advisor to the Chief on policies and programs for the U.S. Army Reserve, and the first African-American woman to earn the distinction of a two-star general in the U.S. Army Reserve. The late Dr. Maya Angelou—World-renowned poet and author. The recipient of 30 honorary degrees, and former Reynolds Professor of American Studies at Wake Forest University. Lisa Price—Founder of Carol's Daughter hair and beauty brand, a favorite of celebrities, and now sold in stores from coast-to-coast. Now owned by L'Oréal, Price is still at the helm of this growing business. Jane Carter—A professional hair stylist/colorist and salon owner, she founded the Jane Carter Solution after an allergic reaction caused by prolonged exposure to chemicals in traditional hair care products. Today, Jane Carter Solution sells millions of dollars' worth of products in Whole Foods Market, Sally Beauty Supply, Walmart, Target, CVS and Walgreens stores. A'Lelia Bundles—Great, great granddaughter of the first Black female millionaire and hair-care creator, Madam C. J. Walker. She has teamed with Sephora and Sundial Brands to launch the Madam C.J. Walker Beauty Culture product line. A'Lelia is also a seasoned journalist, public speaker, and author of the New York Times bestseller, On Her Own Ground: The Life and Times of Madam C. J. Walker. Words have power, and those that Black women often use to describe their hair are derogatory: nappy, steel wool, out of control. They often personally inherit these terms and pass them along without even realizing the crushing effects these words have on their feelings about the person they see in the mirror. Hairlooms is not another book that addresses the practical ways of styling Afro-textured hair naturally. Hairlooms asks: Why is it so difficult for Black women to embrace their hair? And how can Black women overcome the multi-layered challenge of embracing their natural hair and beauty? Author Michele Tapp Roseman helps readers answer these questions for themselves, to write a new story that they can pass along. Guided exercises throughout help readers "comb through" their self-perceptions and form a plan for self-acceptance and personal empowerment. See more about Hairlooms at: hairloomsthebook.com.